A year outside Ashton Under Lyne Jobcentre. 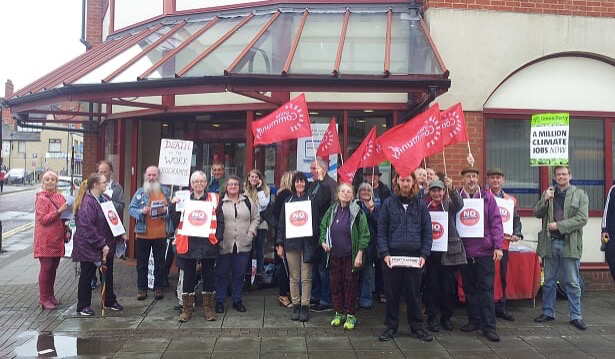 Today we celebrated a full year of demonstrations outside the Jobcentre every Thursday. It’s been an amazing year, one that has shown that a smaller protest can and is effective. 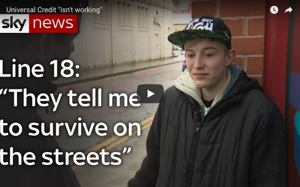 We started our Jobcentre demonstrations last year when we were disgusted to hear that a young pregnant girl was sanctioned for attending her workfare interview and telling them that she was pregnant. We decided that as a group Tameside Against The Cuts would take a stand. Not only was this sanction illegal it put the life of the young girl and her unborn baby at risk. It highlighted to us that the situation regarding sanctioning was far worse than we could imagine. Armed with a banner that we had previously used at other demonstrations and some cardboard placards we decided that a weekly demonstration was needed to highlight this issue. We had no other resources except our knowledge as a group of how the system worked, and what could be done to help others. It proved to be more popular than we thought. We were inundated with requests for help, and the situation for the people using Ashton Under Lyne Jobcentre was pretty dire. It seemed that all rules regarding sanctioning were being ignored and they were a law unto themselves. So we continued. Within the first few months of demonstrating we heard of suicides and such desperate cases that we couldn’t believe it. We knew that this Tory government could be cruel but the levels of cruelty that they would go to seemed unreal. We produced our own leaflet. It was very basic but it did the job. We have since improved on this first leaflet and are now I think on our 3rd or 4th edition. This leaflet informs claimants of their legal rights and how to fight a sanction, also how to cope whilst you are sanctioned. This has proven to be very popular and has been reproduced by several other groups around the country. The input of Boycott Workfare whom we work very closely with has enabled us to produced a very clear step by step guide on the back of our leaflet. So many thanks to them. I only ever thought that there would be a few of us stood outside the Jobcentre but I was wrong. Instead of the number diminishing they are increasing. People from all walks of life join us and from all over the country. We really appreciate this. People are seeing that they system is very wrong and it needs changing. I was told a while ago that our demonstrations wouldn’t achieve anything. We were just wasting our time they said.. They were very wrong. Our demonstration has helped to highlight the issue of sanctioning to a huge extent. We have been part of the sanctions debate in parliament, we helped to make 2 dispatches programmes highlighting the horrors of sanctioning. This blog has become a massive success and is talked about all over the place, even in other countries. As a result I now have regular features in The Morning Star newspaper. In fact our demonstrations themselves have been praised and discussed amongst many groups up and down the country. And they use ours as an example of positive action. Why have we been successful? I think this is because of a good combination of many different types of people. We all have our own political beliefs but we join together on these issues. We welcome everyone who comes in peace, we aren’t abusive and we respect everyone. Hard to do sometimes when someone is shouting at you “get a job”. It’s all down to good teamwork. What support do we get? We get lots of support from the community, Unite in the community have been fantastic as have The Green Party. Many of us are members of both. However we do have to produce most things ourselves which can be hard work sometimes. Are we going to continue? Yes we are. For as long as the evil sanctioning regime exists we will be there. We have become to be of great support to claimants entering the Jobcentre and have helped to prevent 3 suicides to our knowledge.. Thank you so much for your continued support. 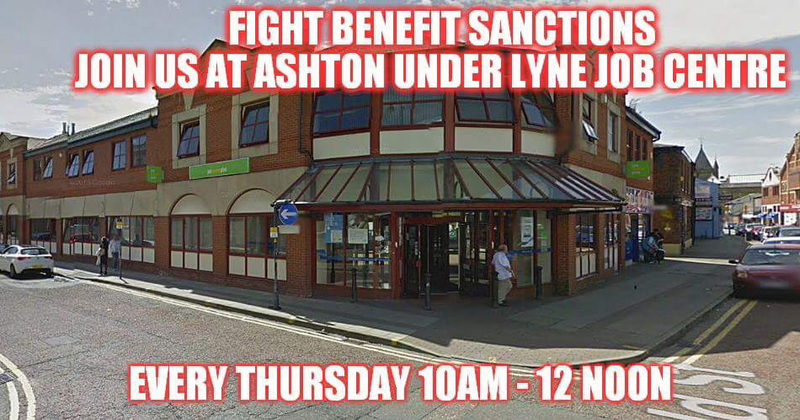 See you outside Ashton Under Lyne Jobcentre next week! We don’t receive funding for any of the work that we do. We would really appreciate any donations to help us to continue with our actions and our blog. A year to be proud of! Well done Charlotte for keeping the blog and the weekly demos going, and thanks to all who support you. If I lived locally, I would be there in my wheelchair! Well done for all your hard work; it won’t go unrewarded. I’d be standing there with you, but I’m there in spirit! Thank you! It was a wonderful day! Back next Thursday as usual!